The Sailing School is located in Riverside, NJ at G. Winter’s Sailing Center, 8 Reserve Ave, Delran, NJ 08075. We offer lessons in Basic Keel Boat Sailing, Coastal Cruising, Bare Boat Cruising, and Coastal Navigation as well as Private Lessons. 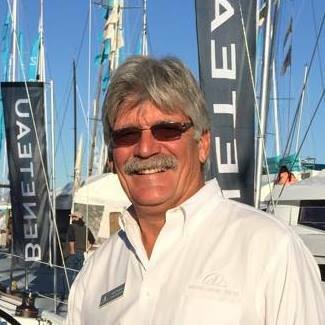 Captain Gary Thomas (a USCG licensed Captain) has been involved in sailing for over 50 years and teaching new sailors for the last 35. Starting out at the Red Dragon Canoe Club on the Delaware River, he introduced new sailors to the sport of dinghy sailing. That led to involvement with the Eastern Shore Small Craft Institute on the Chesapeake Bays Eastern Shore where for twenty years Gary went from teaching American Red Cross Basic Sailing to Instructor Trainer, to coordinating the entire program. In 1998 he went to work with the Philadelphia Sailing School as a Basic Keel Boat Instructor teaching American Sailing Association certification programs. In 2012 he opened The Sailing School, located at G. Winter’s Sailing Center in Delran, NJ. Starting in 2019, we are pleased to announce locations in Delran, NJ, Penns Landing Marina, Philadelphia, PA, and Osprey Point Marina in Rock Hall,MD on the beautiful Chesapeake Bay.